You Are Here: Home > Buying vs Leasing a Car – What is Right for You? Buying vs Leasing a Car – What is Right for You? How can you get the best new Toyota models for super-affordable prices? Just ask your friends and neighbors in Warwick, Providence, Cranston, North Kingstown, and Pawtucket and they’ll tell you: Go to Balise! At our Toyota financing center, we’re proud to say that we’ve worked with drivers from all backgrounds, with all kinds of needs, on all kinds of budgets. We believe that quality, reliable transportation is a right–not a privilege–and we’ll work to make it happen for you. We understand that personal credit is complicated, and sometimes situations outside of your control can tank your score. Our finance experts will always help you to get the very best deal on a new sedan, hatchback, SUV, truck, or hybrid–even if you’ve been turned down at other dealerships. So if you’re ready to buy, tell us: will you buy or “ba-lease” your new Toyota Camry, RAV4, Corolla, Highlander, or Prius? Read through our brief overview of the two options below to see if one financing solution stands out over another. If you still can’t decide, we urge you to contact our finance department–we’ll be able to go over all of our budget and credit concerns, and work to find the right deal for your needs. Why Should You Lease a New Toyota? Car leasing is nothing particularly new; in fact, it’s been around in some capacity since the 1960’s, and was adopted across the industry by the late ’80s. And it’s stuck around for such a long time because it offers great benefits to both the driver and the dealership. You get to drive a fun, stylish, brand-new car for between two and three years that you then trade in, and we get a healthy stream of high-quality used cars to fill our lot. And, when you lease a car with Balise Toyota of Warwick, you’ll enjoy a whole list of benefits beyond just the vehicle, like world-class customer service, quality service and maintenance, and more–and we’ll get the opportunity to earn a customer for life. It really is a win-win. When might leasing a Toyota be the right choice for you? When you lease a car, you enjoy lower monthly payments than on a comparable new car loan, but drive under some very simple limitations: a certain number of miles per year, and a certain length of time. The rest is all up to you! While leasing is a fantastic option for all sorts of drivers, we know that there’s nothing quite like getting the keys to a vehicle that’s well and truly yours. When might buying a car be the right choice for you? If you agreed with the statements above, then buying might be right for you. But if you found yourself question, then consider leasing a new car – you can always choose to buy later on! What Makes the Financing Team at Balise Toyota of Warwick a Cut Above the Rest in the Greater Providence Area? We know sometimes the number of financing options can be tricky–especially when it comes to the flexible leasing plans offered by Toyota Financial. Fortunately, we’re here to help. The team at Balise Toyota of Warwick is committed to helping you get into the best new car for your needs, whether that’s through a standard auto loan or a fully-customized lease agreement. Even if you have less than perfect credit, we can help you secure auto financing. When it comes to leasing especially, it may seem like every dealership offers the same deals, however you shouldn’t take such a major commitment at just face value. 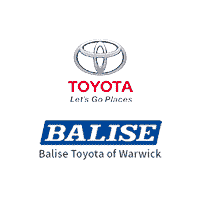 At Balise Toyota of Warwick we are committed to providing an exceptional customer service experience, so you can count on us to make the car buying or leasing process easy and even fun. And we will be there for you long after you sign on the dotted line. Our on-site service center provides prompt and reliable maintenance with a smile, and with everyday low prices on car repair, you can spend more time relaxing in our comfortable waiting area and less time fretting about service expenses. We believe in building long term relationships with our customers, so before you decide to lease or buy from just anyone, consider which dealership is going to provide you the best service both during the deal and once it is signed. We’re confident you’ll do better at Balise. Learn more about your buying and leasing options at our Toyota dealership serving Providence and all of Rhode Island. Contact us online or call the Finance Department at 401-352-5911 to schedule an appointment with our lending experts.